When Jackie French wrote her Diary of a Wombat in 2002, the world fell in love. Not only did Jackie bring the antics of an adorable Australian creature to life, her particular wombat echoed to perfection typical two-year-old behaviour. While children were entranced, carers chuckled in recognition. 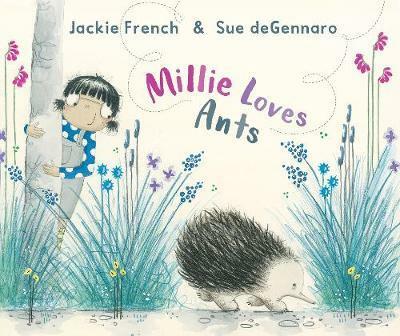 In Jackie's latest picture book, she ponders my favourite creature: the echidna. With a young girl living on the land as our guide, we watch echidna's dogged pursuit of food while its prey – ants of every shape and size – provide the entertainment. Sue deGennaro's slightly ridiculous, super-sized ants carry away everything from soap and rolling pins to socks and an electric drill. Not only will readers of the future be engrossed in the story at hand, their eyes will be searching for the unexpected booty these six-legged stars manage to haul. Then the sweetest twist reveals itself on the final page, prompting little hands to hurry back to the beginning and read all over again. Therein lies the magic of Jackie French and indeed, any great storyteller. After all, aren't multiple re-reads what the best stories are all about?